AMMONNEWS - Speaker of the Syrian People’s Assembly Hammoudeh Sabbagh met on Sunday with a visiting delegation from the Jordanian Engineers Association. Sources in the Syrian capital quoted Sabbagh as underlining the importance of strengthening relations and exchanging experiences between trade unions and professional associations in Syria and Jordan. The head of the delegation, Ahmad al-Zoubi, said the association was ready to support the Syrian people during the reconstruction and rebuilding stage, especially in the fields of electricity and renewable energy. 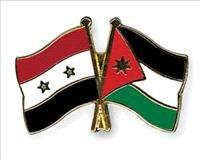 During the visit, the Jordanian and Syrian engineers unions signed an agreement to cooperate and facilitate the development of scientific exchange for the first time in years.